Exactly twenty-five years ago I started studying Chinese at SOAS, and to commemorate a journey of learning that has taken me far and ended nowhere, I thought it would be nice to show off some souvenirs from China that some very generous friends of mine have kindly given me over the past year or so—four gifts in four different scripts that I am interested in. My first souvenir from China is a set of 100 postcards depicting Qing dynasty imperial seals that my friend Tom Gewecke picked up at a used book fair, and generously gave to me as "a token of the enjoyment I get from your blog articles". This set, titled Precious Seals of the Qing Dynasty (故宮信片第五集：清代寶璽), is the fifth in a series of about fifteen thematic sets of postcards issued by the Palace Museum during the 1930s. Each card shows the imprint of a seal, together with a brief description of the actual object. The inscriptions are mostly in a mixture of Chinese script and/or Manchu seal script (with only a handful in the ordinary Manchu script). I have scanned all the postcards and put them on my web site, but I am afraid that I have not yet got round to cataloguing them properly. 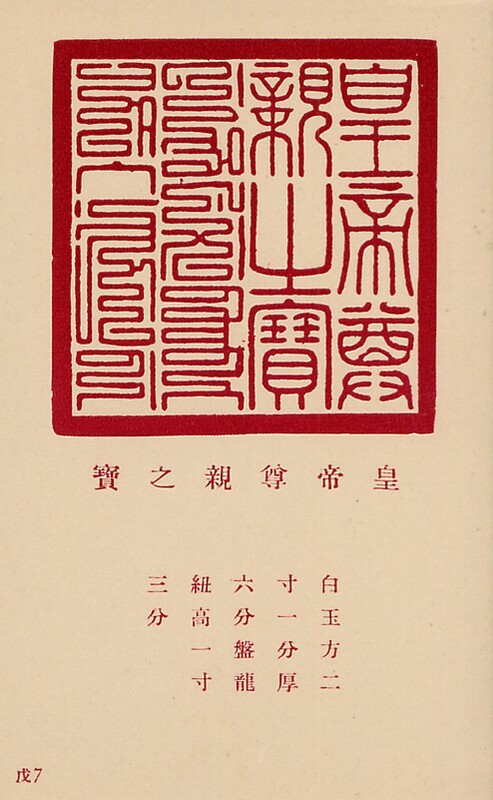 The seal depicted on the postcard shown below is one of the "twenty-five treasures" designated by the Qianlong Emperor in 1746, and has the Chinese inscription huángdì zūnqīn zhī bǎo 皇帝尊親之寳 "The Emperor's precious [seal] of parental respect" on the right, and the Manchu seal script inscription han-i niyaman be wesihulere boobai (with the same meaning) on the left. Apparently the original seal was inscribed in Chinese characters and ordinary Manchu letters, but in 1748 the Manchu text was recarved using the newly devised "seal script" form of Manchu letters. You can see a picture of the actual seal itself at this site. If you are viewing this page with Internet Explorer running under Windows Vista then the Manchu text on the left of the postcard should display correctly; but with other platform/browser combinations there may be no joining or shaping of Manchu letters, or the Manchu text may not display at all, or else the Manchu text may not be oriented vertically (click here to see an image of the Manchu text as it should be rendered). 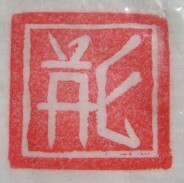 Manchu seal script was created by order of the Qianlong emperor in 1748, and at first glance is similar to the earlier Mongolian seal script which can still be seen on modern Mongolian bank notes. I was hoping to create an OpenType Unicode Manchu seal script font this year, but unfortunately all my spare time has been occupied by Tangut, so I have not yet had time to do so ... maybe next year. My second souvenir from China is a simulacrum of a Shang dynasty turtle plastron with a divination inscription in the soon-to-be-encoded oracle bone script. It was bought for me by my friend and co-conspirator Michael Everson when he was at the WG2 meeting at Hangzhou this time last year. It arrived in a big package with a book on the famous Women's Script 女書 of Hunan province (which is currently in the process of being encoded), but my eldest daughter unwrapped the package and hid the turtle until Christmas. I'm not too sure about the inscription. 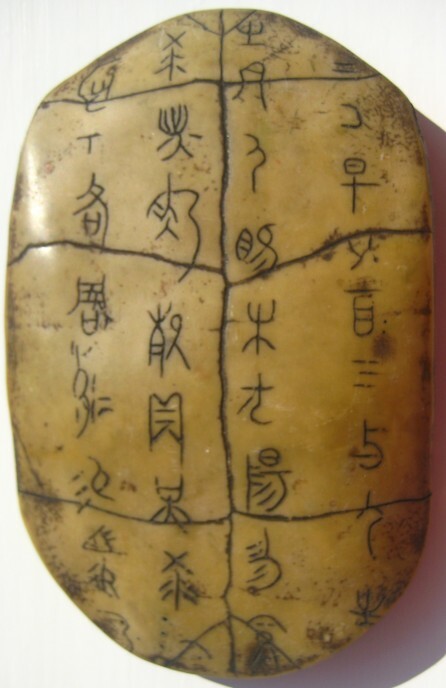 The words 㱿貞 "Que divined" on the second column to the left immediately jump out (Que was an important royal diviner during the reign of King Wu Ding 武丁), but the rest of the text does not accord with typical oracle bone inscriptions, and some of the characters seem suspect to me. Zhuangzi was fishing in the Pu river when two high officials sent by the King of Chu went up to him and said, "We wish to burden you with the affairs of state!" Zhuangzi held onto his fishing rod, and without looking at them replied, "I have heard that in Chu there is a sacred turtle which died more than three thousand years ago. The king has it wrapped up inside a basket that is placed high up in the ancestral hall. This turtle, would it rather be dead but its dry bones revered, or would it rather be alive and dragging its tail in the mud?" The two officials said, "It would rather drag its tail in the mud". Zhuangzi said, "Go away! I am about to drag my tail in the mud". Book of Zhuangzi The Outer Chapters : Autumn Floods #11. My third souvenir from China is a carved wooden seal with an ivory (?) 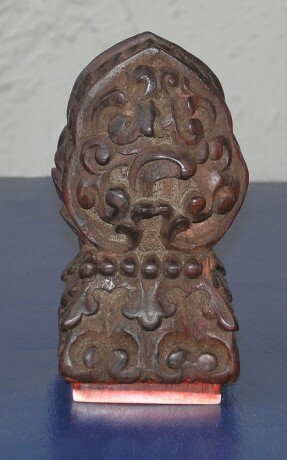 face on which an inscription in the seal script style of Phags-pa script is engraved. The seal was bought by a correspondent from an eBay seller who claimed that it was a genuine ancient Tibetan seal, but it is in fact a modern creation with a copy of the Phags-pa script inscription on a real 14th century seal held by the Norbulinka Palace in Lhasa carved on it. After I had exposed it as a fake and pointed him in the direction of some more genuine seals, my correspondent was kind enough to send me the seal as a curio. When an eBay seller tries to pass off such an object as a genuine antique then it is a fake that should be shunned by all, but as a modern fantasy it is a beautiful object which I am proud to possess. The inscription is particularly resonant with me, as it is a phonetic rendering in Phags-pa script of the Chinese title tongling shijiao dayuan guoshi 統領釋教大元國師 "Leader of the Buddhist Faith and Imperial Preceptor of the the Great Yuan dynasty" that was bestowed by Khublai Khan (reigned 1260-1294) on the 'Phags-pa Lama (c.1239-1280) and his successors; and so in a somewhat fraudulent way this object connects me with the creator of the script that I helped usher into the computer age. 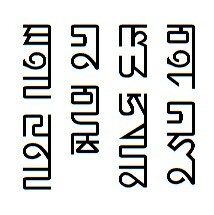 The Unicode transcription of the inscription below should hopefully display correctly in the next version of Windows, but in the meantime, if you have the BabelStone Phags-pa Book font installed, it may possibly render correctly in some browsers ... although not in any that I know of (click here to see an image of the Phags-pa text as it should be rendered). 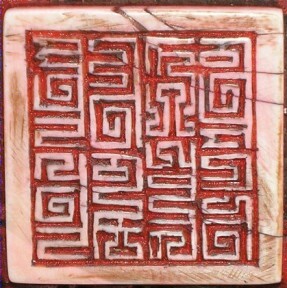 My fourth souvenir from China is a beautiful Tangut script seal made from a special type of stone from the Helan Mountains (賀蘭石) that my ever-generous friend Vladimir Belyaev bought for me on his recent trip to the Royal Tombs of the Western Xia (and thence, to my great envy, to the ancient Tangut fortress city of Kharakhoto). 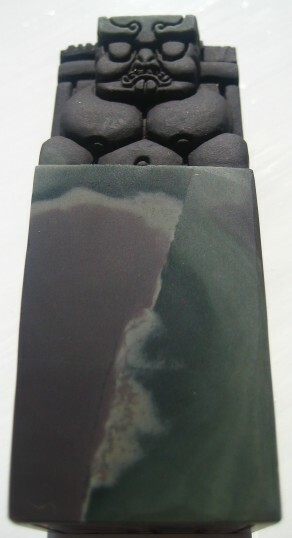 The figure with pendent breasts and a large tummy that is carved on the seal is modelled after one of several stele bases that have been found in some of the royal tombs. 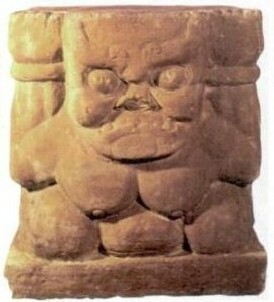 These grotesque figures are very different to the typical turtle base that is used for Chinese stelae, and as none of the bases still has an attached stele there has been some debate as to whether they are stele bases (碑座) or column supports (柱础); but given that fragments of broken stele have been found in the viscinity of some of the bases, it seems most probable that they are in fact stele bases rather than column supports.